Left extremists have taken to the streets of Berlin nightly, causing mass havoc in protest of being kicked out of a building they had been squatting in. The continuous nights of violence from radical left-wing extremists in the German capital was sparked by the forced eviction of squatters from the building known in the Berlin anarchist scene as “R94”. R94 stands for Riga Street 94, the address of the building which far-left activists and anarchists have been squatting in for decades. 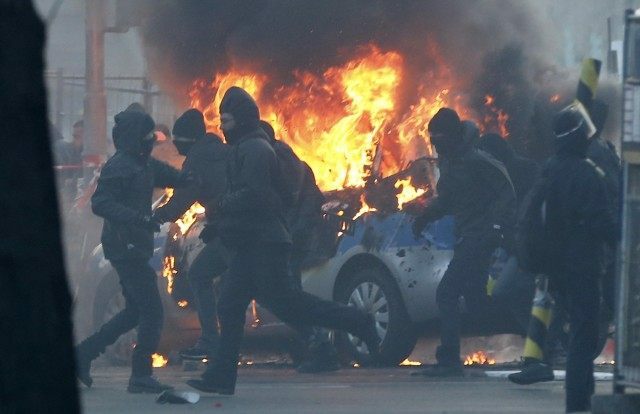 On June 22nd Berlin police moved to remove the illegal squatters, and as a consequence the far left extremists have been burning cars and smashing shops on a nightly basis, reports Frankfurter Allgemeine. The site is owned by British company Lafone Investment, based in the British Virgin Islands. The owners, who due to the threat of violence from the extremists, had to be accompanied by both private security services and the special branch of the Berlin police (SEC) in order to view the site after the eviction took place. The company says that they are interested in converting the bottom floor of the building into an asylum home for migrants. In the aftermath of the eviction, which the squatters referred to as “Day X”, there have been nightly riots in the area. Authorities say that various left-wing websites have been the driving forces behind the violence, advocating that their supporters cause as much disruption as possible. This has led to police officers being attacked, banks and real estate company shopfronts smashed, and numerous cars set on fire across the German capital. Frank Henkel, a member of German Chancellor Angela Merkel’s Christian Democratic Union (CDU), has called the actions “arbitrary terror” and has launched an investigation to route out the perpetrators of the attacks. The CDU politician has said that his party will not allow lawless areas to exist in the city “in Riga Street or anywhere else”. Mr. Henkel added that the R94 symbolises left-wing violence, though the anarchists see themselves as fighting so called “gentrification” – urban neighbourhood development which results in increased property values and sees the displacement of lower-income residents. The eviction of the anarchists is part of a wider trend in the area of Friedrichshain, which is experiencing a transformation away from the dilapidated “punk rock” surroundings of yesteryear, to being “revitalised” through new construction projects. While there are still hold-outs who rent the old buildings, often sporting anti-police banners, the area is nevertheless undergoing a rapid change. Left-wing violence is on the rise in Germany and far outpaces its right-wing counterpart. A report from the German police revealed that the scale of left-wing violence is often completely ignored by German media who focus on right-wing violence almost exclusively. Left-wing extremists have also been responsible for attacks on members of the anti-mass migration Alternative for Germany (AfD), and for publishing party members’ names and addresses.